To confer the Yarchos Chenmo in Nubra and teaching at Jivetsal, Shey, His Holiness the 14th Dalai Lama reached Leh on July 3. Thousands of devotees lined up from Kushok Bakula Rinpoche airport to Jivetsal, Shey welcomed His Holiness. On his arrival at Jivetsal Photang, His Holiness was greeted by the senior spiritual leaders including His Holiness Chetsang Rinpoche, His Eminence Galden Tripa Sras Rinpoche, H.E.Thuksey Rinpoche, H.E Palga Rinpoche, H.E Stakna Rinpoche, HH Taklung Tsetrul Rinpoche, and other religious and political leaders. 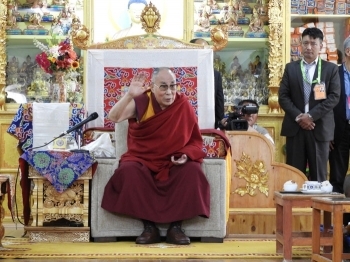 His Holiness Dalai Lama said, “I have visited many times to Ladakh and every year there are lots of infrastructure development and the monasteries have also developed. Monasteries should become a learning center rather than just confined to a religious institution. The tradition is developing which is a very good thing”. Talking about the materialistic development and the growing emotional clashes in the world His Holiness stressed on carrying out the message of love, compassion, forgiveness and tolerance among each other.